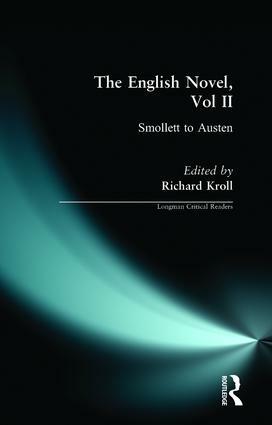 The English Novel, Volume II: Smollett to Austen collects a series of previously-published essays on the early eighteenth-century novel in a single volume, reflecting the proliferation of theoretical approaches since the 1970s. The novel has been the object of some of the most exciting and important critical speculations, and the eighteenth-century novel has been at the centre of new approaches both to the novel and to the period between 1750 and 1800. Richard Kroll's introduction seeks to frame the contributions by reference to the most significant critical discussions. These include: the general importance of 'sentimentalism' as a cultural movement after 1750; its relationship to the emergence of the Gothic novel as a specific genre or mode; the rapid rise in the number of women novelists in the later eighteenth century; the relationship between the novel as mediator of social relations and the idea of the 'public sphere'; the relationship between novelistic codes and the massive growth of a consumerist society; the class conflicts of writers like Smollett; the effect on the novel of the new 'British' nation; and the effects of the French Revolution and the subsequent political debates on writers like Wollstonecraft, Godwin, and Austen. This collection will be of interest to students of the later enlightenment, and also to all who are interested in late eighteenth-century radicalism, and the general relationship between literature, history, and politics. 1.1 George Starr, "'Only a Boy': Notes on Sentimental Novels." 1.2 Margaret Anne Doody, "Desserts, Ruins and Troubled Wasters: Female Dreams in Fiction and the Development of the Gothic Novel." 2.1 John Barrell, "A Diffused Picture, An Uniform Plan: Roderick Random in the Labyrinth of Britain." 2.2 Robert Folkenflik, "Self and Society: Comic Union in Humphry Clinker." 3.1 Jonathan Lamb, "The Comic Sublime and Sterne's Fiction." 3.2 Carol Kay, "A Sentimental Journey: Purposeful Play." 4.1 Ian P. Watt, "Time and Family in the Gothic Novel: The Castle of Otranto." 4.2 Julia Epstein, "Cecilia: Money and Anarchy." 5.1 Mary Poovey, "Mary Wollstonecraft: The Gender of Genres in Late Eighteenth-Century England." 6.1 Donald R. Wehrs, "Rhetoric, History, Rebellion: Caleb Williams and the Subversion of Eighteenth-Century Fiction." 7.1 Marilyn Butler, "The Juvenalia and Northanger Abbey." 7.2 Claudia L. Johnson, "The Juvenalia and Northanger Abbey: The Authority of Men and Books."